Optimum biosecurity is critical for protecting broiler and breeder flocks. Arbor Acres biosecurity training featured hands-on learning and collaboration. 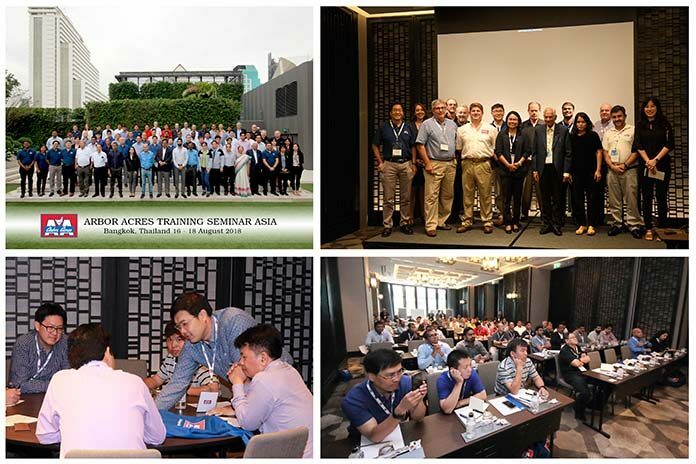 Aviagen® welcomed more than 80 guests from across Asia to its annual Arbor Acres® Training Seminar in Bangkok on Aug. 16-18. Multiple areas of biosecurity concern were covered, including proven methods for ensuring quality feed, as well as effective farm and hatchery management procedures. “We want the best for our customers, and always seek ways to improve their operations for the benefit of their birds and their businesses. Biosecurity is a topic that is very relevant today, and we’re happy to offer critical advice to help protect birds from disease while improving overall performance,” explained Rod Konrad, Senior Technical Service Manager for Arbor Acres Asia Pacific. Students to this year’s training were enthusiastic about the practical format, as it helped reinforce the strict practices important in protecting bird health. “I would like to thank Aviagen and the Arbor Acres team for organizing this successful and rewarding training program, which is essential to overcome the challenges of infectious diseases such as Avian Influenza. It was great to see participants from different countries, backgrounds and expertise actively exchange ideas on effective biosecurity at the farm and hatchery. The information on how the correct ventilation, as well as different types and the proper usage of disinfectants, affects biosecurity was of great help. The overall program was beneficial in stressing the importance of biosecurity in optimizing the full performance of the Arbor Acres breed at all levels and in various countries, whether in Asia or other international markets,” explained Dr. Jeff Huang, senior group manager, CAB Malaysia.